Water is of vital importance to plants. The plants expand huge amount of energy in absorbing water from the soil, but the loss of water by transpiration results in tremendous energy. Under conditions of deficient water supply the enormous loss of water by transpiration causes wilting, serious desiccation and often death of the plants. The deciduous trees have shed their leaves to conserve water during unfavorable conditions or seasons at the cost of their photosynthetic activity. Under condition of rapid transpiration and inadequate water supply the plants wilt and their leaves may dry up may even fall, especially the older ones. The growth is checked and photosynthesis is retarded. As a result, the plant yield is greatly reduced. According to Tumanov (1927), a single severe wilting, if the plant survives, results in reduction of final plant yield by as much as 50 percent. Although the roots absorb water by osmosis but it has been observed that in rapidly transpiring plants the proportion of water moving into roots by osmosis is negligible. In these plants, transpiration pull helps in absorption of water and its upward movement. In this way, continuous water stream is established from roots to top of the plant. Mineral absorption is predominantly active process and mineral supply to leaves is just as great at night as during day. However, some workers suggest that a significant amount of salt absorption takes place passively under the influence of transpiration pull. It has been observed that tomato plants growing in green house with high humidity and carbon dioxide rich air how calcium deficiency because under these conditions the stomata are close and transpiration ceases to occur. It is believed that rapid translocation of minerals in transpiration stream may create mineral deficit in the roots which may result in diffusion of minerals into roots from the soil. However, transpiration is not essential for absorption, transport or distribution of minerals, since minerals deficiencies have not been observed in slowly transpiring plants. Heat energy is injurious to cell protoplasm and the leaves absorb about 65% of sunlight that fall on their surface, therefore get warmed. 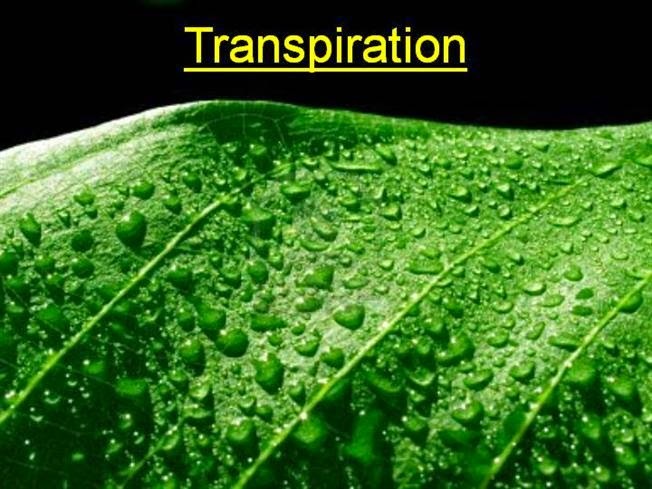 Transpiration is a powerful cooling process since water molecules have a light talent of vaporization and each gram of water transpired absorbs 2.4 to 2.5 kJ from the leaf and its environment. Therefore, it helps to dissipate the absorbed radiant energy. High rate of transpiration brings about an increase in the cone nitration of solutes in the cells, thus increasing carbohydrates contents of the fruit. Such fruits have a higher dry matter content and are firmer than those that come from plants that have greater supply of water. Increased transpiration favours the development of mechanical tissue so that the plants become stockier and tougher and more resistant to mechanical injury by wind, rain, insects, etc. the cell walls become thick and highly cutinized thus making the plants resistant to pathogenic fungi and bacteria. It has been observed in some plants that optimum turgidity is required for best functioning of the cells. The over-turgid or under-turgid cells do not grow well. Transpiration help to maintain optimum turgidity. However, the hypothesis requires more testing as there is little evidence to support it. It is the simplest way to measure transpiration. The method is usually employed to measure transpiration in small potted plants and involves weighing a potted plant at the beginning and at the end of a prescribed period of time. The pot is wrapped with aluminum foil to retard evaporation from surfaces other than the plant. The loss in weight of plant over a short period of time is due to transpiration since loss or gain of weight due to photosynthesis or respiration is insignificant. The amount of transpiration of excised parts of plants such as leaves, fruits and branches can also be measured by using this method.